Chris Hickson is a primary school teacher. Today was his very first time visiting the conference. He came because he wanted to hear others views on the different uses of technology. He said that he is enjoying the conference, and rightly so. Pam O Brien helped organise this conference and helped find many of the 32 speakers. She is a lecturer in maths here at LIT Tipperary, Thurles Campus and says that this conference will give first, second and third level educators a chance to share their ideas. A conference well organised ! Nicola O Connor is a ScreenWay iPad and computer tech expert , she gave us a great demo and explained how technology is used both in work and ordinary life. A good chat! This year we introduced a Youth Media Team to the conference for the first time. Here they are in their distinctive red polos…. 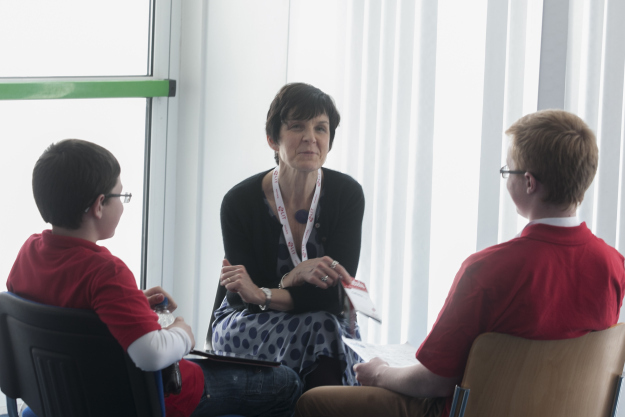 and also the ‘less-young’ mentors who really enjoyed working with this wonderful group of young tech-users; Joe Dale, Bernie Goldbach and myself. We all learnt from the experience. Ann Marie gave a talk about internet awareness, anti-bullying and the negative impact of certain apps. She was saying that you should learn how to use technology with your kids. She said that you shouldn’t block websites as then the children will want it more. She showed us ‘Aftermaths’ which is a website that you go on and solve maths problems before your granted access to social networking sites. The more you solve the more time you can have on your chosen website. She mentioned the three Cs; keep checking, keep communicating and keep current. She mentioned that even though ‘Snapchat ‘ is great if you have children that live away from you, there are also negative. People can use it as a way of ‘sexting’ and bullying. While sitting and listening to Mary Jo Bell’s ( @7mjb) talk I realised something , this woman knew her stuff big time. Sure she was a little late starting and showed some stuff she probably didn’t need to. But her talk was very informative and her use of technology in the classroom was superb. A great talk! 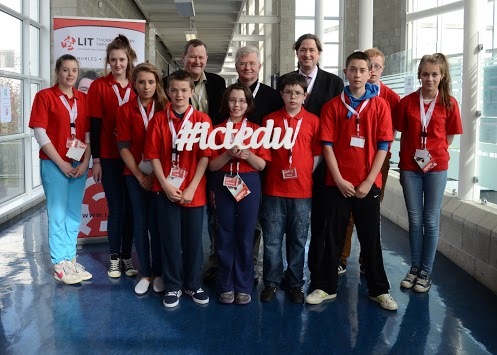 As part of the Youth Media Team (#YMT) at the ICT in Education Conference at LIT today we interviewed Maria Hinfelaar (Presidant of LIT since 2004). She gave us her opinions on teachers in schools using technology such as email and Facebook to communicate with students and improve teaching in general. She also listed the technology she uses herself in daily life. Catherine Cronin was also talking at the conference in L.I.T Thurles about “student voices”, how teachers should help and listen to students and learning experiences that stayed with you. 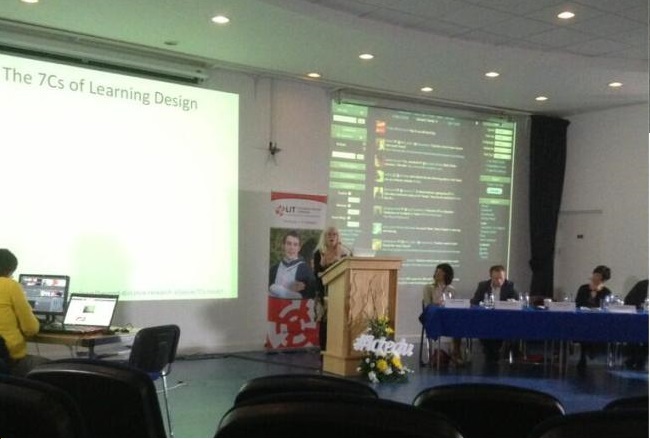 She also talked about teaching and learning over social media and how to try and integrate it into the classroom. 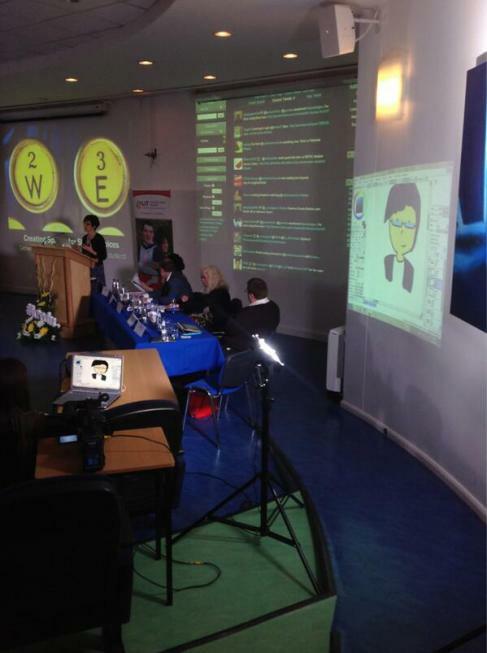 She also covered the importance for teachers to listen to students and work with them using technology. 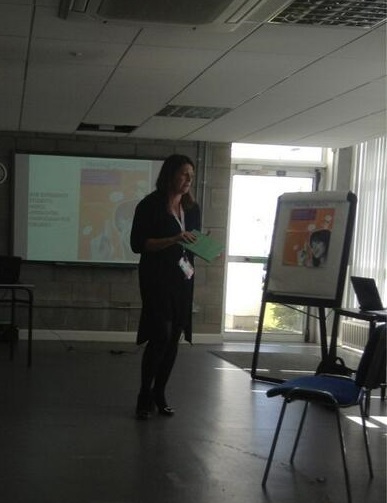 Grainne Conole was talking at the conference in L.I.T Thurles about ”learning journeys and learner voices through new technologies.” She spoke about the nature of learning and how it is changing rapidly into technology. She was saying that ”Complexity is the new reality and we are taking small steps to understand it all”. She pointed out that the Internet emerged in 1993 and how it has developed immensely over 20 years. So she questioned what it will be like in 10 years time. Results from a survey showed that children cannot live without technology and that we feel below par if we do not have technology. She said that ”Our teachers don’t necessarily have the computer literacy to teach it” so we need to teach the teachers about technology as this generation of children have grown up in technology. To help this process ‘Metis’ is a learning design for teachers.